Seeing this tree in bloom for the first time makes one think of a weeping willow which, surprisingly, is covered with bright-red, bristling, bottlebrushes! These “brushes” are actually flower stamens arranged around the ends of the branches. 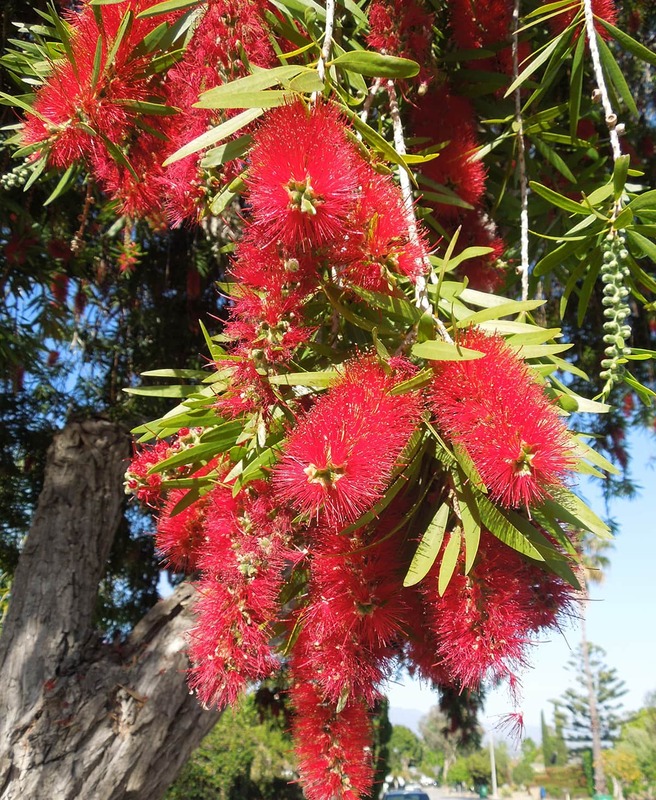 The Weeping Bottlebrush Tree has many attributes that make it highly desirable for Santa Barbara. It is a medium-sized tree, with graceful, pendulous branches covered in light-green leaves 4 inches long and ½ inch wide. Between April and June, the 8-inch long red flowers add an explosion of color to the landscape. A native of New South Wales in Australia, it finds itself quite at home in our Mediterranean climate. It grows at a slow to medium rate to ultimately reach a height of 30-40 feet with a spread of 20 to 25 feet. The growth habit can be somewhat irregular, so occasional pruning is recommended in order to shape the canopy and to keep the weeping branches raised. Additional watering is necessary for a young tree, but once it is established, our normal rainfall is sufficient. However, it can tolerate – and looks better with – regular landscape watering. Another big plus – it doesn’t seem to be plagued with any insect pests or diseases. Its botanical name was recently changed from Callistemon to Melaleuca viminalis. The genus synonym, Callistemon, means “beautiful stamen”. The species name, viminalis, refers to the long flexible branches that make it so willow-like. There are many other forms of Bottlebrush trees and shrubs. Selected cultivars offer a variety of interesting characteristics. Notably, the lemon bottlebrush, M. citrina, is a smaller tree which lacks the weeping growth habit, but is a little more drought and frost hardy and has leaves that smell delightfully lemony; it has a popular dwarf variety named “Little John” that is a handsome compact shrub only 3 feet tall. 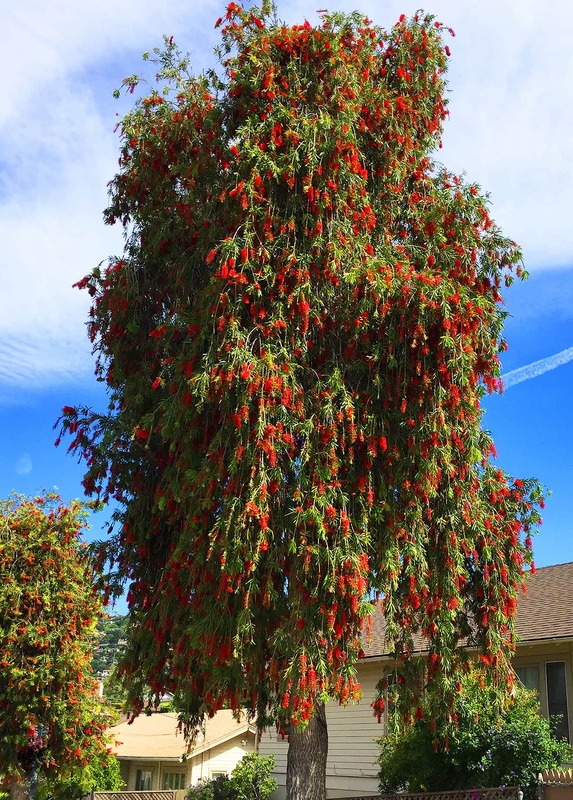 Weeping Bottlebrush are mature street trees all around town, particularly on the following streets: Kentia Avenue, Eucalyptus Avenue, Portesuello Avenue, Richland Drive, Broadmoor Plaza, the 300-400 Blocks of Voluntario Street, and the 200 block of Quarantina Street.